Guatemala’s music unites a wide range of styles from different origins. Through the different stages of history manifests a rich musical and cultural life of their own characteristics and universal validity. is essential to study the iconography preserved in codices, ceramics and wall art. The instrumentation of the Maya as these pictures consisted of wind instruments (wind instruments) and percussion (idiophones). The first of these families instrumental groups several types of instruments: flutes and bone, different types of flutes, whistles and ocarinas variety of designs, and whistling vessels. In polychrome vessels from different periods are also represented and over the shells. The Bonampak murals also depict a group of Mayan warriors playing long trumpets as they still appear in the Rabinal Achi 19th century. In the group of idiophones is the tun, a dugout with a H-shaped incision in two tabs which are struck with sticks resulting crude. This instrument is still occasionally seen in Guatemala. Then there are the drums of wood with a single membrane of deerskin or jaguar, as well as turtle shells of various sizes, scrapers and shakers. Musical instruments were characterized by their close connection to the deities of the Maya pantheon. While traditional Guatemalan music has origins in ancient Maya culture, whose elements are merged from the sixteenth century with components of culture and Afro-Caribbean Spanish. 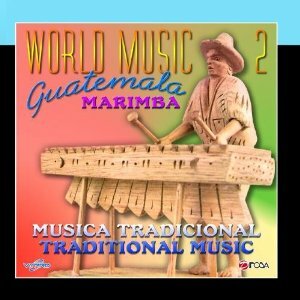 This is represented in the marimba is considered the national instrument, which contains conceptual and constructive from each of these three cultures that form the basis of the Guatemalan culture. had a remarkable development from the original cultural model. It distinguishes the bow marimba, a portable instrument with a keyboard equipped diatonic gourd resonators, the simple marimba, which is stationary, being supported on wooden legs, and occasionally provided sound boxes made of wood, and the marimba double or color, invented in 1894, which has in addition to the original diatonic keyboard (which represents the white keys of piano) keyboard equivalent additional notes to the black keys of the piano, which is achieved by playing the chromatic scale of twelve sounds. This invention opened the door to lamarimba could assimilate piano music in vogue at that time, and resulted in the great popularization of the instrument during the twentieth century in Guatemala.